I had seen some really adorable pin cushions on Instagram and Pinterest and had yet to try my hand at making one, so in February I signed up for the IG Pin Cushion Swap (#IGpincushionswap) to make my first pin cushion. My partner, Maja, lives in Croatia and she mentioned that she loves Disney, Smurfs & bright colors." 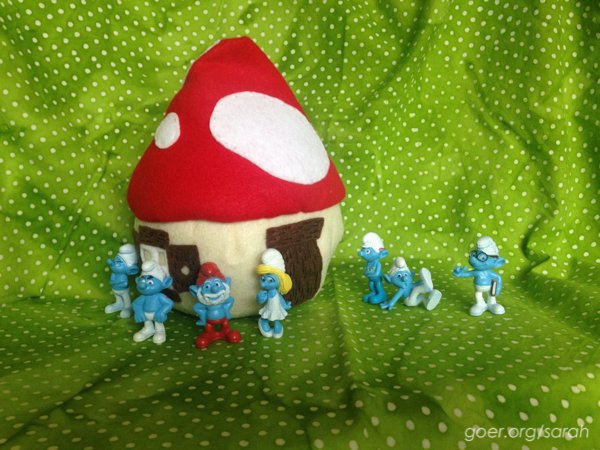 I like to send extras along with my swaps and found a little set of Smurf figurines. 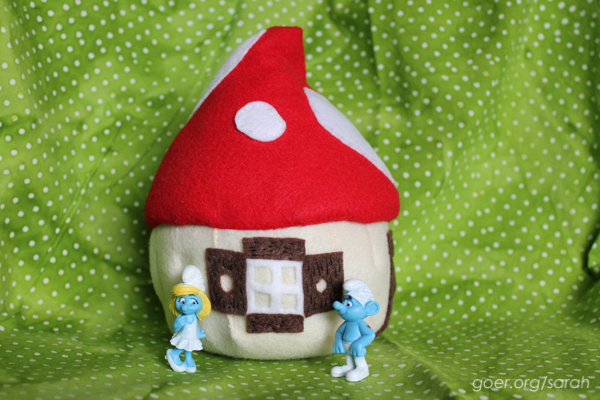 That gave me the idea to make the actual pin cushion be a Smurf house. 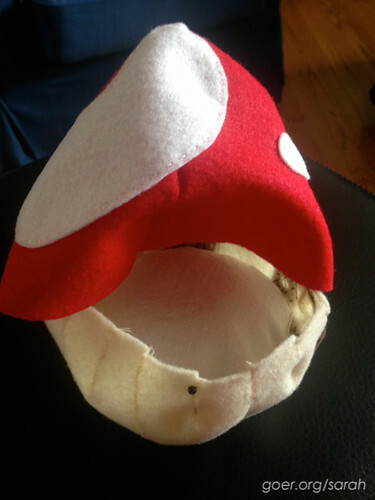 I made it out of felt and went through a process of trial and error for what would work to make it the right shape. 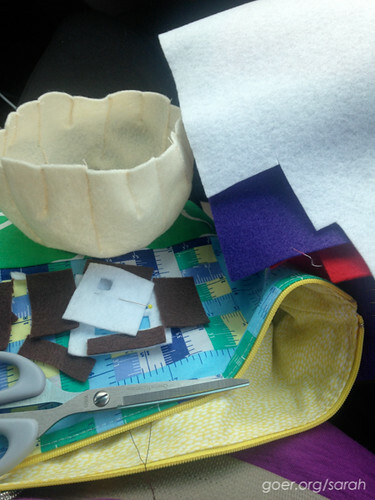 Since I do not enjoy sewing felt on the sewing machine, the whole project is hand sewn (oh, except for a little liner pouch to hold the crushed walnut shells). I don't typically hand sew, but I think it worked out well. I started with a 8 1/2" circle. My first prototype had a base that I made by folding darts in the circle. 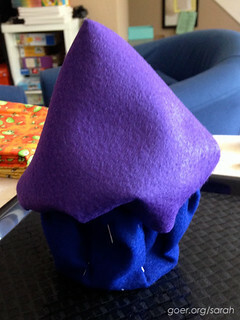 The roof of the house is close to a semi-circle, as large as I could cut from a single 8 1/2" x 11" piece of felt. It didn't look like much at this stage, but I figured it would work and just hoped it would come out as cute in reality as it was in my head. My second prototype base had less bulk because I cut Vs for the darts instead of folding the felt. Still a little wonky looking. 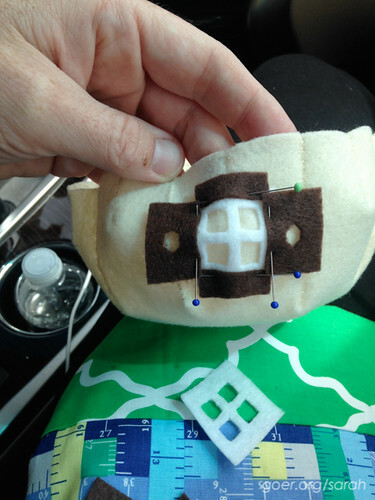 At this point I started the long journey of hand stitching. This meant the project could go on vacation with me for some car sewing. You can see how I cut my circle for the base of the house. Nothing is measured. It's all just eyeballed. So unlike me. 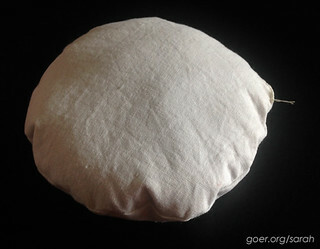 I purchased crushed walnut shells to put in the base of the pincushion and poly fill for the rest of it. Once I'd stitched the walls of the pin cushion I was concerned that my stitches might not have been perfect enough to keep the smallest crushed walnut dust inside, so I created a little pouch to hold the walnut shells. 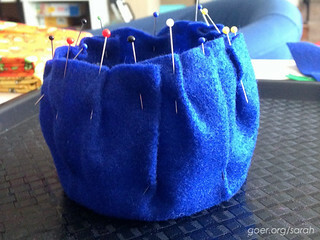 I slipped it into the base of the pin cushion before stuffing it with poly fill. Here's the entire package I sent for the swap. Maja told me that it was "absolutely amazing and [she] only wants to use it as display." ;-) The best part is that she forgot that she mentioned Smurfs on her swap form so she was totally surprised. Win! 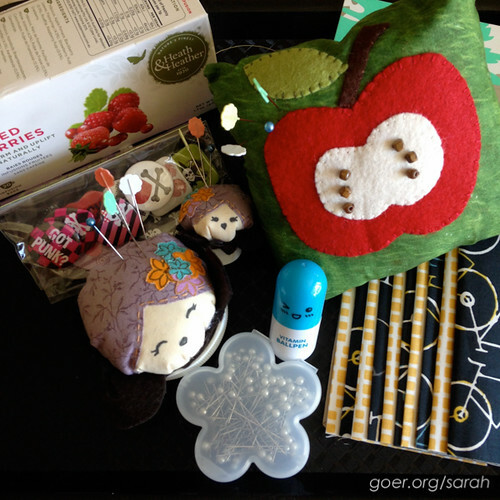 Here are the three pin cushions (and so many other goodies!) that I received from my partner, Jenipher. Aren’t they cute! The little ones are a bracelet and a ring pin cushion. That's right! Pin cushion jewelry! I'm linking up at TGIFF, Finish It Up Friday, and Needle and Thread Thursday. This finish is one of my Q2 Finish Along goals. I'm linking up with the Q2 Finishes party. Posted in Sewing. 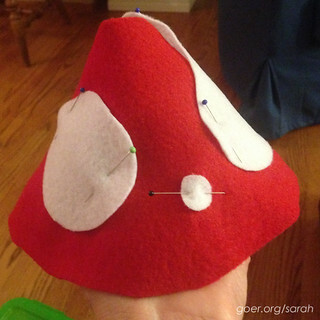 Tags: felt, hand sewing, IG Pin Cushion Swap, Smurf house, swaps on June 26, 2015 by sarah. The cutest pin cushion ever. What a great idea! Thank you, Allison. It's unlike me to not work from a pattern, so I'm very pleased with how it worked out. The package I received was very generous. If only you could smell how divine the tea smells! 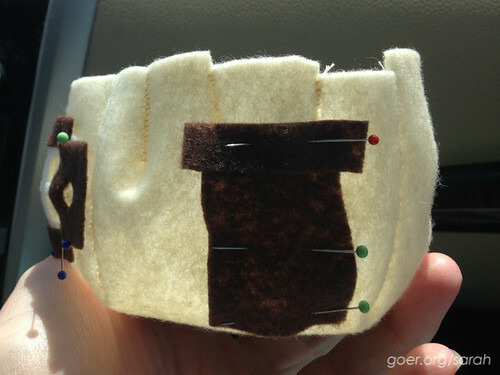 I think that your pincushion is quite possibly the cutest pincushion I have ever seen. It's been awhile since I have watched the Smurf's but it looks spot on. And also the most giant? ;-) I loved watching Smurfs as a kid. The theme song kind of auto-plays in my head whenever I see a picture of them. Thanks for visiting! Well that was fun reading your blog...Such a cute idea!! 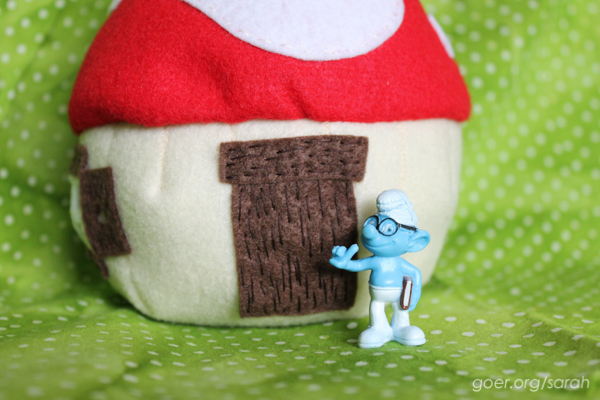 Your Smurf house is adorable!! And all the goodies that went with it, perfect!! So cute and creative. Loved the posed photos too. That's such a delightful pincushion I'm not surprised it's going to be "just for show". Beautiful result of all your hard work. Thank you so much, Heidi. 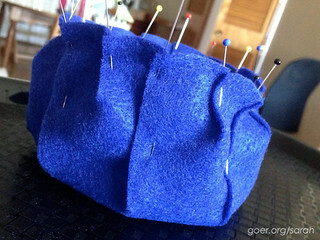 It's hard to come up with a new idea for a pincushion but I have to say this was one bright idea. You also executed it to perfection. It would make a great pattern. Thank you. 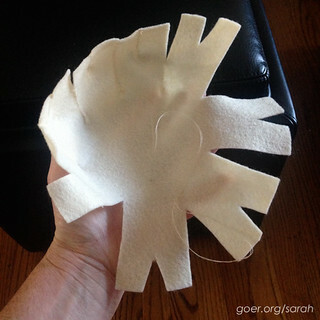 When I run across my prototype pieces (they were never sewn, just pinned/clipped) I'll have to see about drafting them so I can add them to the blog. 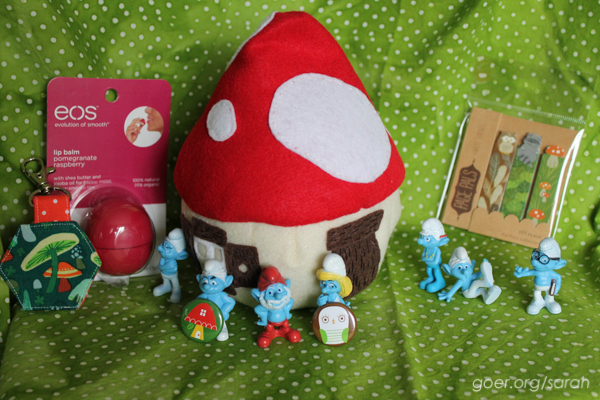 That smurf pincushion is awesome! I can totally understand why your partner would want to display it and not actually stick any pins in it. Thank you so much, Cheryl. Thank you, Beth! I had the figurines before I decided to make the house for the pin cushion, so I just couldn't resist making it "actual size" for them. ;-) I'm glad you like it. Love this idea! the house is really cute and I has some of those figurines when i was a kid and loved them! Well that's very cute. 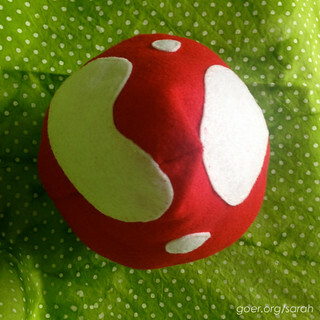 I love playing around with felt, and what you've made for the challenge looks perfect. I remember Smurfs too! Thank you, Wendy! I think I need to play with felt more often. That wee shroom is adorable! Thank you for lynking up with me for TIGFF!